Neutrogena Visibly Clear Pink Grapefruit Oil-Free Moisturiser // I’ve written a blog post about this and the matching cleanser (which I no long have in my possession. Link to the blog post – here) so I won’t go on about how much I hate this all too much. All I will say, though, is that this is going to make your skin look like a spotty volcano. It’s also going to have very similar moisturising qualities to do dud Champneys night cream that I just mentioned; where is my moisture!? Rimmel Apocalips // I’ve mentioned my hatred for this range at least once before but I couldn’t help but mention it once again in this post. I know that a lot of people and bloggers think these are incredible and match them up to the Hourglass Opaque Rouge lip lacquers but I honestly see no good qualities. It cracks, dries my lips and is just generally crap. Even so, I have decided that I will try another one of these this year and then do a blog post all about my final impressions on them; so many people adore them and I really wish that I did, too! 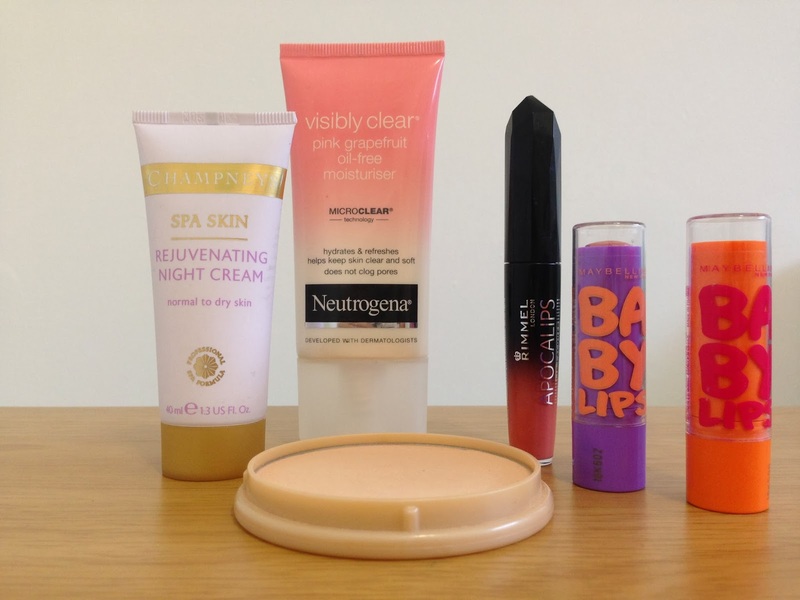 Maybelline Baby Lips // These are the only things from this post that I don’t hate. Saying that, though, I do find that they are pretty crap and I only seemed to love them so much because of the hype. These are supposed to be tinted lip balms (which I’m sure you all know), but I beg to differ that they are truly tinted and that they are good lip balms. The colour pay offs are really ugly and look just strange, and the hydrating quality is terrible. If you’re looking for a decent moisturising lip product from the drugstore, it’s the Revlon lip butters all the way. Rimmel Stay Matte powder // I mentioned in Tuesday’s post that I’d replaced this powder after suddenly hating it and I still stand by that judgement. I heard the hype, bought it, fell in love, and then soon realised how horrible it made my skin look. It left my makeup looking cakey and when oil came through, you could actually see patchy powder! What a horrible experience.